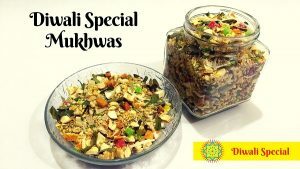 Instant Chorafali Chaat – an instant chaat recipe made from Diwali Snack “Chorafali”. 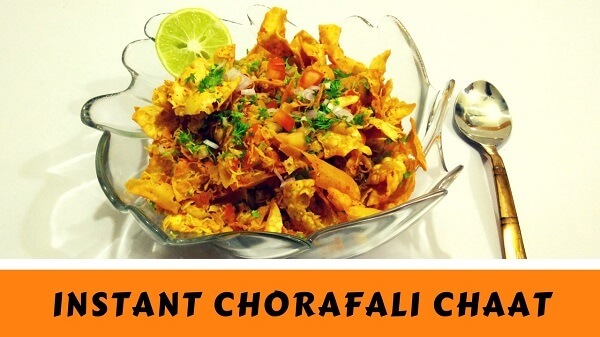 Very Easy to prepare and tasty snack with chopped Tomato, Onion and other ingredients added in Chorafali – a traditional Gujarati Snack. You can measure ingredients as per your taste. Follow this simple recipe and make delicious & unique chaat recipe at home. Take 2 tbsp Red Chilli Powder and 1 tbsp. Rock Salt, mix well. Add Chorafali in a large bowl and gently crush them using a spoon. Now, add all the ingredients one by one – Tomato, Onion, Coriander, Besan Sev and fresh Coriander. Sprinkle a mixture of Red Chilli Powder and Rock Salt as per your taste. Gently mix all the ingredients with a spoon. Serve Instant Chorafali Chaat immediately.